Inspired by a recent dinner we made at my job, I wanted to recreate the same kind of flavors at home but with a simpler approach. And with Spring here, I wanted something light yet filling. Deciding on this dish was a no brainer. 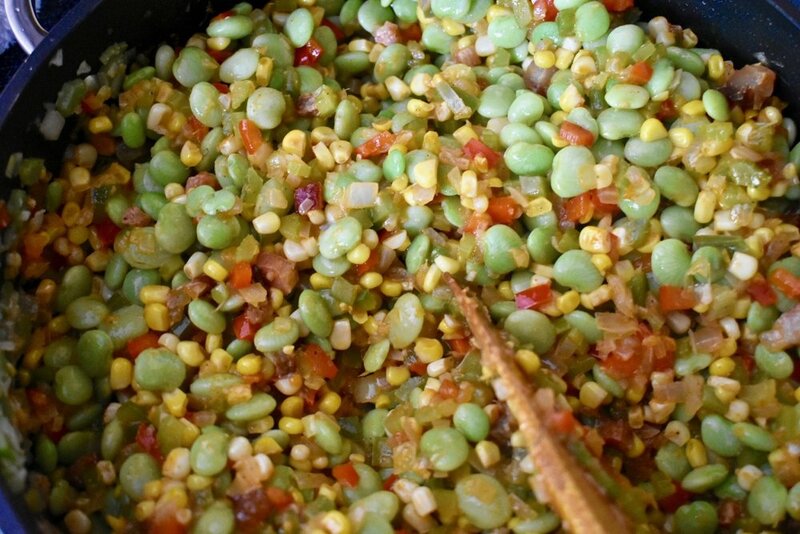 Fresh, sweet corn, juicy tomatoes, crispy and tender lima beans all come together with smoky bacon and plump shrimp in one pot. 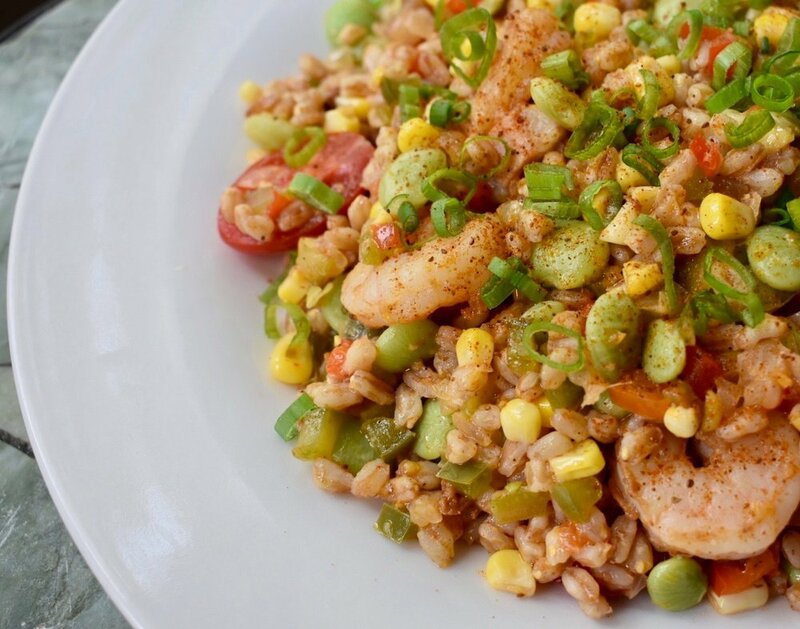 Two things: I chose a smaller sized shrimp than what I normally get since it would be easier to eat in one bite with the succotash and I decided to add some farro into the mix to round everything out. Farro is a great alternative for rice and pasta and has a great texture and nutty flavor; it honestly went perfectly with the flavor profile I was going for. This recipe comes together very quickly, so you want to make sure that you are ready to go with your mise en place (think of it as a stir-fry and everything gets tossed together in as little steps as possible). I made this recipe a pretty large serving size because this would be an excellent option for meal prepping the leftovers. Also, it’s still delicious eaten cold as a substitute for salad throughout your work or school week. In a large mixing bowl, toss together the shrimp, 2 teaspoons of kosher salt, and 1.5 teaspoons of baking soda. Set the shrimp back in the fridge and let them marinate for at least 15 minutes. This quick brine will help keep the shrimp moist and crisp at the same time. It’s a really interesting technique and all of the cool, food science stuff is all explained here. It’s a great way to make sure the shrimp don’t get mushy while cooking them since it helps them retain their texture and snap. 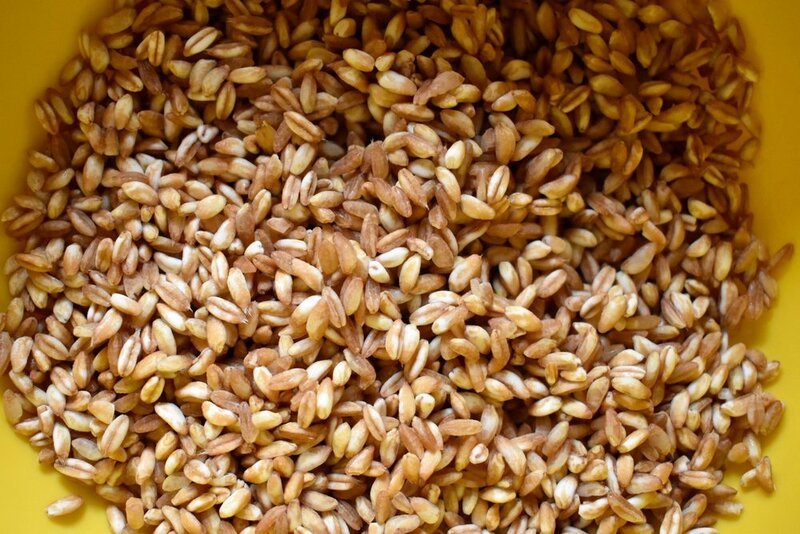 Farro is such a pretty grain. Next, cook the farro according to package instructions using seafood stock instead of water. While the farro is cooking, in a large sauté pan or pot, add the cubed bacon or fat back. Over medium heat, render out the fat until it’s crisp. 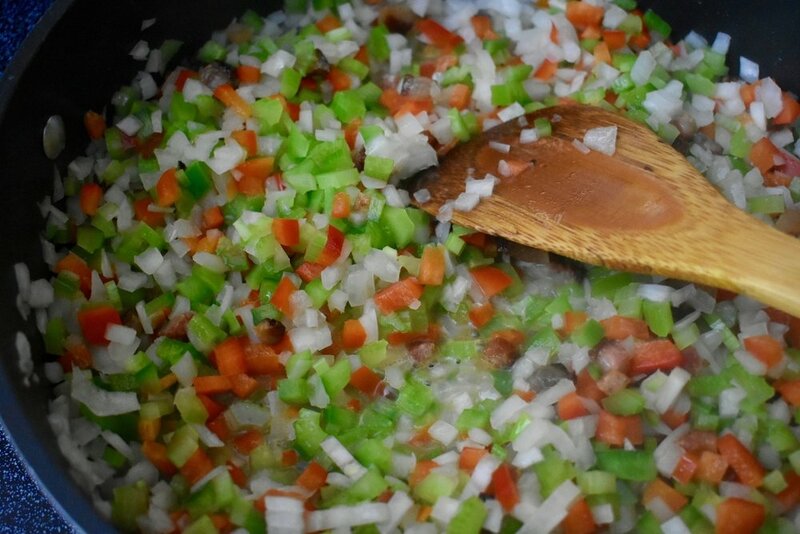 Once the bacon is almost done cooking, add the diced onion, green pepper, red pepper, and celery. Liberally season with kosher salt and fresh cracked black pepper. Sauté for 5 minutes or until the onions are translucent and the vegetables are soft. Next, and if you like, you can toast up the fresh corn in a cast iron skillet with a small coating of oil prior to mixing it in with the other veggies. Definitely optional, but I like the extra nuttiness of the toasted corn. Either way, add in the corn and stir. Sprinkle the smoked paprika over the vegetable mixture and fold in the blanched lima beans. Turn the heat down to a low simmer and fold in the cooked farro. Cover the pan with a lid and set aside. Next, it’s time to work on the shrimp! Remove the shrimp from the fridge. Rinse the shrimp and drain them well. Lightly season them with Old Bay seasoning and set aside (remember, they’ve already been brined). Preheat a large frying pan over medium-high heat and add enough oil to the pan to coat the bottom. Once the oil is shimmering in the pan, add the shrimp and cook them in small batches to avoid them steaming. Make sure to spread them evenly and allow enough room in between them. You won’t need to cook the shrimp all the way through since they’re going to be mixed in with the warm farro and succotash. Once the shrimp are pink and firming up, flip them and cook for another minute max. Set the shrimp aside on a plate until all of the shrimp are cooked. Then, add the shrimp and their juices to the farro and succotash. Cover and let the mixture hang out for about 3 minutes to finish cooking the shrimp through. 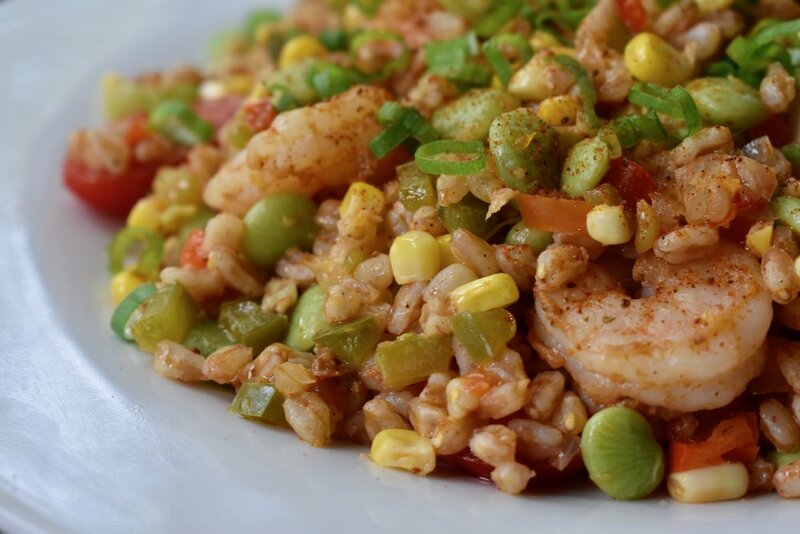 Immediately serve the shrimp and farro succotash. Garnish with sliced green onions, a big squeeze of fresh lemon, and a little more Old Bay seasoning.